Athyrium attenuatum (tapering to a point), synonym A. filix-femina 'Attenuatum', with some 21 other synonyms (Khullar 2000), is a deciduous Himalayan with an erect rhizome, short brown stipes, and 18-in. (45-cm), symmetrical, obovate, bipinnate fronds broadest in the middle sections of the 18 to 24 pairs of pinnae. This species comes from a complex botanical family tree influenced by A. filix-femina over the years. As a garden plant without the historical complications, it is in cultivation in Germany and adapts to the typical woodland culture of shady sites in Zones (5) 6 to 8. It should be a willing subject within the broad spectrum of climatic variations that accommodate the assorted lady ferns. Athyrium brevifrons (short fronds), synonym A.filix-fem-ina 'Longipes', is another species loosely affiliated over time with the lady fern. 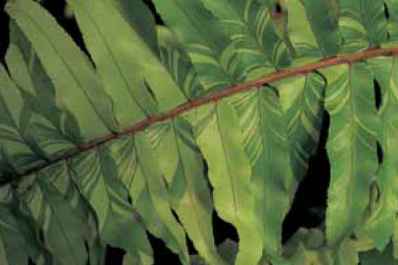 It has long russet stipes of one-half of the frond length and broadly lanceolate, tripinnate blades. The whole frond approaches 3 ft. (90 cm), making the epithet something of an oxymoron. This species is a deciduous addition to moist woodland gardens in Zones 5 to 8. Athyrium delavayi (after French missionary Jean Marie Delavay, 1834-1895) is a Chinese endemic with fronds of 1V2 to 3 ft. (45 to 60 cm). The broadly lanceolate, deciduous fronds are bipinnate with sessile, lobed and blunt-tipped pinnules. Frond color is a saturated milky lime-green on a reddish structural support. This species should cast a bright light in the dark areas of shade gardens in Zones 7 to 9. Athyrium iseanum (of Ise Province, now part of the Mie Prefecture, Japan) has long been incorrectly associated with the Japanese painted fern. It does have fronds with a bicolored tendency, but they are not the marbled marvel of the ubiquitous painted fern. Unlike the painted fern, the rhizome is not creeping or branching. Stipes of up to 1 ft. (30 cm) are greenish tan to purple with the dominant color continuing onto the rachis. Broadly lanceolate blades are bipinnate to tripinnate and slightly hairy on the undersides. This species is from Japan, Taiwan, Korea, and Tibet, and when available is an interesting, delicate, deciduous diversion for shadelands in Zones 7 and 8. Var. angustisectum has narrow ultimate segments. Athyrium palustre (of swamps) is a deciduous Japanese endemic with erect rhizomes, short purplish stipes, and bipin-nate narrowly lanceolate blades of 2 ft. (60 cm). 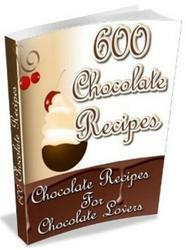 Rickard (2000) recommends it for Zones 7 and 8. Athyrium rubripes (red-footed), synonym A. filix-femina var. rubripes, is from china, Siberia, and eastern Russia. The stipes are red. This species is in cultivation (without rave reviews) in German gardens (as rotstielfrauenfarn, literally redhandled women's fern) and similar to, but slightly smaller than, A. filix-femina. Considering the heritage, it should be hardy. 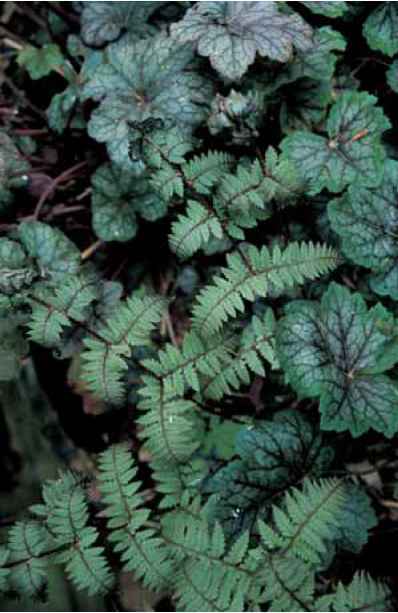 Metallic tones of Athyrium yokoscense match those of many heucheras. species is from Japan, Taiwan, China, and the Himalayas where it grows in wet and shade. It is in cultivation in Zone 7 German gardens. Athyrium wardii (after collector Frank Kingdon-Ward, 1885-1958) is an attractive and colorful species from Japan, Korea, eastern Russia, Sri Lanka, and China. Basally scaly, 5- to 10-in. (13- to 25-cm) stipes are plum-red with the tint extending on into the rachis. The approximately 1-ft. (30-cm) bipinnate blade is broadly ovate, being almost as wide as long with abruptly narrowed apical pinnae. It is a close kin of, and easily confused with, A. clivicola from which it is separated on the basis of having pinnules without auricles and pinnae that do not cross over the rachis.